Though the land the families had to give up has an estimated worth of 12 million kip (U.S.$1,430) per hectare, some received 5 million-6 million kip (U.S.$595-$715) per hectare, while others got 700,000-800,000 (U.S.$83-$95), he said. The families who have not yet received compensation are still able to plant rice, the district official said. But many of them have already opened bank accounts so they can immediately receive money allocated to them once the decision is made, he added. All parties involved in the payout have agreed to the transfer of compensation via bank accounts, the official said. Under Lao Decree 84 issued in April 2016, Lao citizens losing land to development projects must be compensated for lost income, property, crops, and plants. Project owners must guarantee that living conditions for those displaced will be as good as, or better than, they were before the project began. Rattanamany Khounnivong, deputy minister at the Lao Ministry of Public Works and Transport, told RFA in April that provincial People’s Councils in four provinces — Luang Namtha, Oudomxay, Luang Prabang, and Vientiane, also known as rural Vientiane — have agreed on payments of compensation for residents affected by the railway construction project. But officials in Vientiane prefecture, which is separate from Vientiane province, have yet to reach an agreement on payouts, he said. “Now we are in the middle of summarizing the process to issue a handbook about the compensation, and hopefully it will be done soon as it should be, because we want to compensate the affected people in a transparent way,” said Rattanamany, one of the heads of the construction unit for the single-track, standard-gauge rail network. 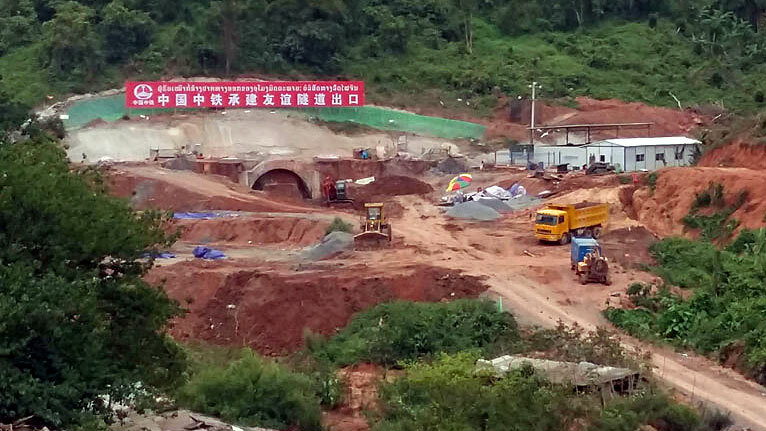 Because many families and their homes in Vientiane are being affected by railway construction, officials are finding it difficult to reach a conclusion on payouts, he said. “And that’s normal because it is the capital,” Rattanamany said. More than 4,400 families affected by the railway construction project may be eligible for compensation. Once the compensation amounts and terms are determined, the Ministry of Public Works and Transport and the Ministry of Finance will issue the payments. In Luang Namtha province in northern Laos, families affected by the project are waiting to receive compensation from authorities to substitute for lost income. One villager who had to move out of his original home more than a week ago now lives in a temporary dwelling that the company involved in the rail project has rented for him. His family of four used to make about 200,000 kip (U.S. $24) a day from items they sold, said the man, adding that he also had lost a small rubber plantation to the rail project. Like other families who have been forced to give up their homes and land, the man said he has been waiting to be relocated and receive compensation since early 2017. He still does not know how much he will receive or where he will be permanently relocated, he said, adding that he would like to be compensated for the full market value of his property so he has enough money to build a new house for his family and find a way to earn an income to feed them. “The authorities expect to compensate all 150 affected families in the province no later than August 2018 because all data have been collected and calculated according to the agreement of every party concerned,” a Luang Namtha provincial official told RFA. About 150 families from the villages of Boh Tenh, Tinh Tok, Boh Piet, and Na Tei in Luang Namtha province will receive a total of roughly 245 billion kip (U.S. $29.2 million).